Rockwell’s art is fun and often comical. It’s full of childhood mischief and American icons. 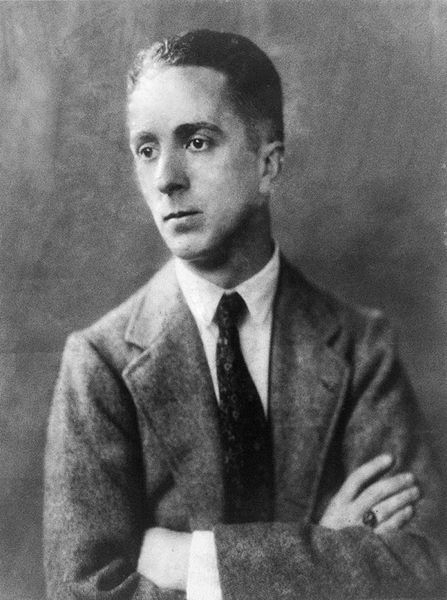 It makes us smile and leaves us longing for the “good ol’ days.” So, I was surprised when I started reading biographies about Norman Rockwell himself and discovered he was a rather insecure guy with a bad case of perfectionism. Rockwell worked hard to become an artist and pushed himself to achieve his goals, such as seeing his art on the cover of the Saturday Evening Post. Yet, he never quite felt like he’d “arrived.” He seemed to constantly need to prove himself and he struggled trying to be what others wanted him to be. I enjoy Rockwell’s art, but now, I’m also a little saddened by it as I remember how unhappy he seemed. When I stopped to really think about Rockwell’s art and correlate it with the historical events of Rockwell’s time, I realize that it was portraying life as something a little sweeter than reality. It’s incredibly tempting to remember Rockwell’s America and wish it could be that way again. However, America was never really like that. The World Wars were ugly and that America struggled then, just as it does now. Perhaps it’s because of Rockwell’s idealist portrayal of America that we love him and his paintings so much. It certainly is nice to escape from reality every once in a while. Later in his career, Rockwell, started including some heavier subject matter with underlying political messages. His 1943 Four Freedoms series was his first major political statement. However, he waited until almost 70 years old to paint about truly controversial subjects, such as desegregation, as seen in his painting The Problem We All Live With (1964). In this painting, he made known his support for the desegregation in schools by depicting the famous 1960 scene of the US Marshals escorting little Ruby Bridges to an all white school. While some people appreciated the painting, others sent Rockwell and the magazine publisher death threats! 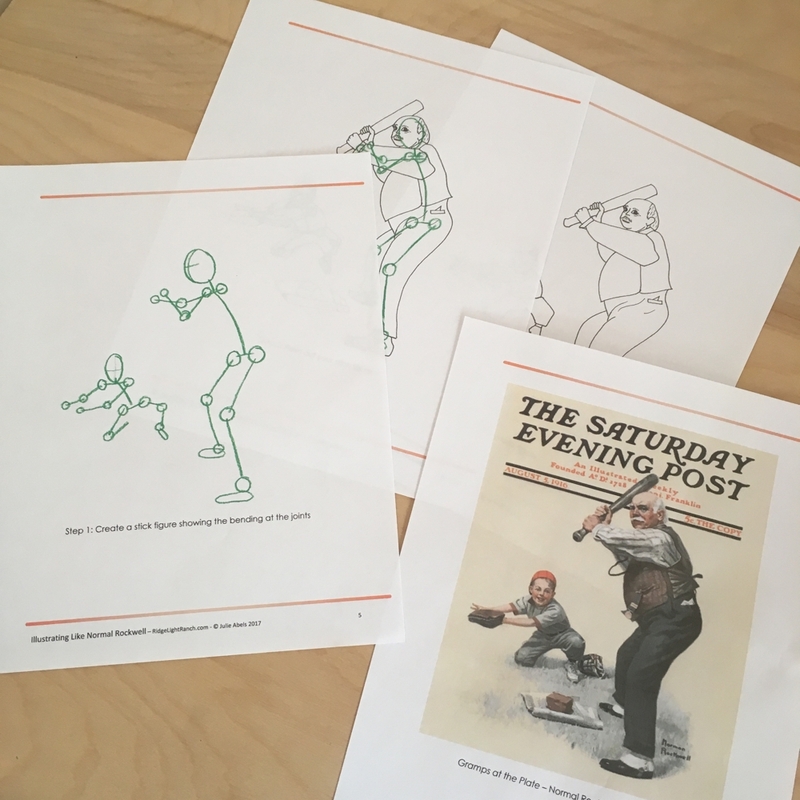 I know that in our short 30 min time block I can’t expect students to think up a clever story, figure out how to illustrate it, and actually draw it so I’m asking them to re-create Rockwell’s painting, Gramps At the Plate, or draw a scene from a favorite book. Recreating great works of art is a very common way for artists to study art. Many aspiring artists have sat in museums and tried their best to replicate famous works of art. Rockwell himself got started drawing by drawing scenes from books as his dad read to him as a child. Rockwell painted almost all his art, spending many hours on each piece. However, we only have a short 30 minute time block to complete our art project. I know for myself, when I’m creating quickly, I find paint very frustrating. So, in an effort to set the students up for success, I decided to encourage them to focus on drawing instead of painting. 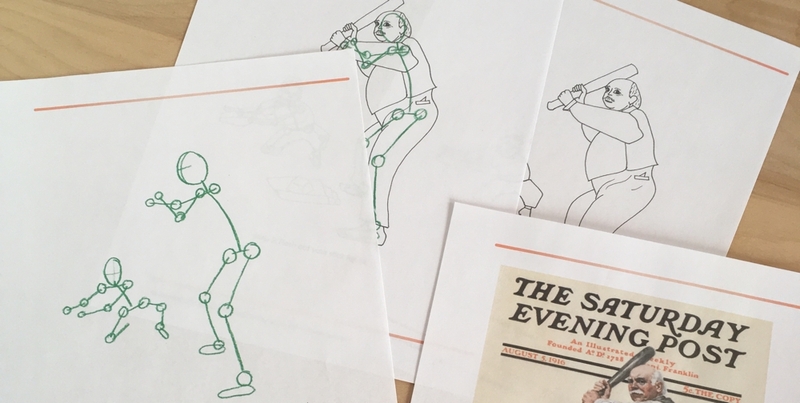 If you have a group of students who are very inexperienced and would be likely to get frustrated drawing a human form, you could let them paint a line drawing of Gramps at the Plate (included in my lesson plan) instead. 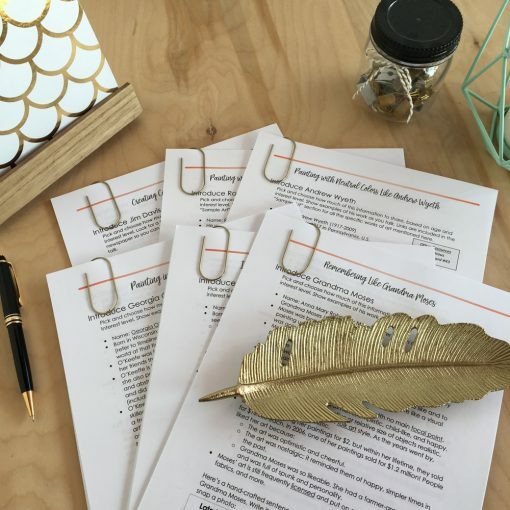 If you’d like to purchase this lesson plan, you can find it here or in our Amazing American Artist Lesson Plan Package. 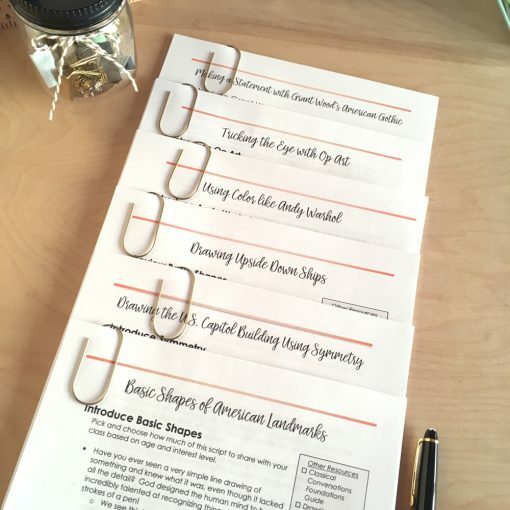 Check Out All my Great CC Cycle 3 Resources Here.